The current schedule has construction starting in 2018 and the new Green Line station open and operational by 2021. In Somerville, Massachusetts, a $1 billion redevelopment scheme in the city's Union Square neighborhood is edging closer to happening after Somerville's Board of Alderman waved through a rezoning plan. The 9–1 vote in favor of the plan last week was the result of three years of planning done by a special development team with the community. The 2.3 million-square-foot Union Square project, if fully approved, will bring 1.3 million square feet of new offices and civic facilities to the area as well as just over 100,000 square feet of public space. Twenty percent of the housing units built will be for families earning a low income, meanwhile, authorities estimate the scheme will see 5,000 permanent new jobs come to the area. 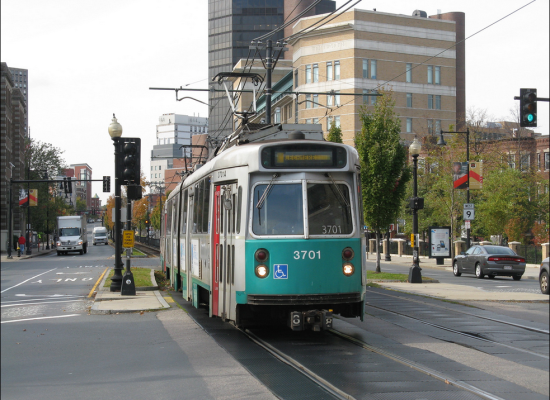 Plans for a Green Line extension for the Massachusetts Bay Transportation Authority (MBTA) are also in the works. 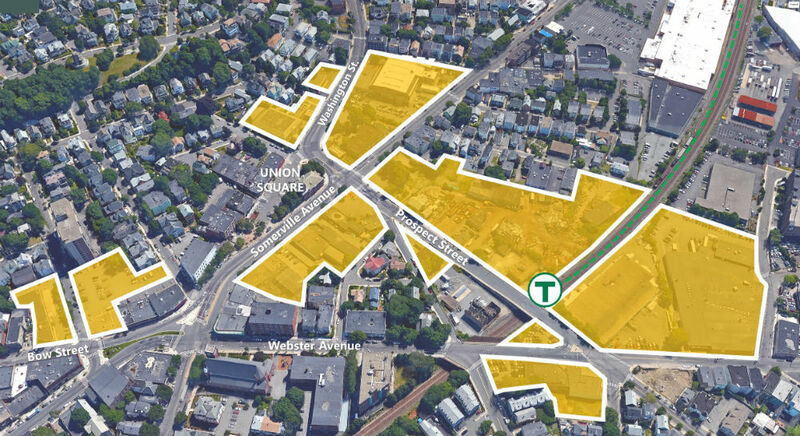 The $2.3 billion project would link Union Square with the adjoining neighborhoods as well as the city of Boston, making Union Square the downtown of Somerville. “Union Square’s proximity to Kendall Square, MIT, and Harvard—one the densest innovation centers in the world—makes it poised for the next wave of economic growth,” said Greg Karczewski, president of Union Square Station Associates (US2), a development team built specifically for the Union Square Redevelopment Project. “We’re bringing 2.3 million square feet of new mixed-use, transit-oriented development to one of the hottest real estate markets.” For the Green Line extension to happen, US2 is providing $5.5 million in the form of a public benefits contribution and around 950 residences, all of which will supposedly result in new property tax growth. Now that the rezoning has been approved, US2 will present a development plan for Union Square to the community in the next few months. Jennifer Park, a resident of Union Square who has long been tracking the project, welcomes the development but is skeptical of what the final result will be. "They're really changing the look of Union Square. At community meetings there were lots of drawings of high buildings, but also lots of green space," she told The Architect's Newspaper. "As a resident and condo owner, I am happy that my property's value is going up." Park, though, also stressed that the feel of Union Square—with its diverse culture of ethnic restaurants and wide range of activities—should be preserved. "We do not want this to be like Kendall Square where the commercial development is dead at night. I am glad there is development here, but just so long as the community supports that development," Park added. The current schedule has construction starting in 2018 and the new Green Line station open and operational by 2021. The plan in full can be read here. The offices of Landing Studio are cluttered with “industrial fossils,” as principal Marie Law Adams calls them: vials of rock salt, cross-sections of old oak piers, a chunk of slag discovered during the demolition of a jet fuel tank. In between the piles of design books, they form a trail of breadcrumbs back to the firm’s founding in 2005, when Adams was hired along with her partner and co-principal Dan Adams to make an attractive public space out of a defunct shipping terminal in Chelsea, Massachusetts. That project went on to win awards for the way it reconciled industrial and recreational uses on the site without diminishing either. It’s typical of Landing Studio’s work, which brings high design to industrial clients that typically don’t get much more sophisticated in their design process than making sure they clear the zoning board. That work continues today, in the fittingly unrefined Boynton Yards District of Somerville, Massachusetts. Several employees share a unit with the firm Reverse Architecture in a converted four-story mill building whose other tenants include two chocolatiers and a fencing club. The building is like Landing Studio’s work itself: Not exactly postindustrial, but wrapped in the eclecticism and grittiness that the word implies; not just a pretty relic of the past, but something still alive and evolving. When it comes to urban planning, the partners said, that reductive “postindustrial” mindset often means disparate industrial uses get lumped together. 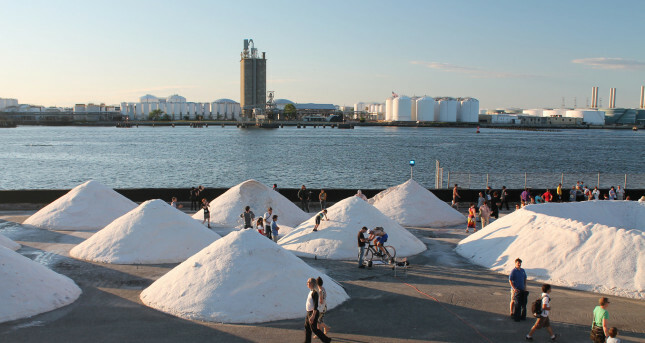 Oil tank farms and salt piles are very different uses that present different opportunities for a designer. But without a firm like Landing Studio, they’re usually glossed over with the same “industrial site” protocol. Infra-Space 1 Boston Designed collaboratively with the Massachusetts Department of Transportation and engineering firm VHB, Infra-Space is the first in a series of unlikely urban revivals. Using lighting installations, bike paths, and stormwater-absorbing landscape design, Landing Studio turned 13 acres of unused land underneath the I-93 viaduct in Boston’s South End into a multi-modal transportation hub. Paid parking sustains the site financially, while recreational use turns a once foreboding underpass into an inviting public space. “The architecture of the freeway becomes really open and monumental,” said Marie. Lumen. (Courtesy Landing Studio) Lumen New York City This summer, Landing Studio will contribute to their fourth “LUMEN,” a one-night film and performance art festival in New York. On a maritime salt dock on the northern shore of Staten Island, Landing Studio builds salt pile landscapes with theatrical illumination, turning mounds of salt into a convertible gallery for artist installations. Boston’s subway system—the "T"—is currently undergoing its first expansion in nearly three decades, pushing the city's Green Line into the hip enclave of Somerville. And while the first stations in neighboring Somerville won’t open until 2017 (at the earliest), the promise of new transit is already transforming the city’s real estate market. The streetscape is coming next. Lisa Drapkin, a realtor in the city, told the Boston Globe, “If someone asks me how the market is doing in Somerville, I say you could put a cardboard outhouse near a [planned] Green Line stop and there’d be a bidding war.” With the first station still years away, prospective buyers and investors are snatching up property before prices spike. According to a report by the Metropolitan Area Planning Council, cited by the Globe, property values near new stations could increase 16 to 25 percent over the next 20 years. Over the same time, average rent could jump 67 percent. This, of course, has many residents and politicians worrying that new Green Line stations will mean rampant gentrification. To that end, the city plans to build 1,200 affordable housing units by 2030, or 20 percent of their new stock. Of course, that could do very little to keep rent down overall. But Somerville Mayor Joe Curtatone is optimistic that new transit options will help lower-income citizens connect to jobs, education and healthcare opportunities. “We don’t want to lose our soul," he told the paper. "We want that creative, original, diverse, that sort of funky, freaky mix of who we are.” When the new Somerville stations open, 85 percent of residents will be able to walk to the train, up from just 15 percent today. And the extension is expected to increase ridership by 45,000, and take 25,000 cars off the road. The Green Line Extension will also lay down a string of new architecture through the city as each new street-level station has a unique style and form. While none are as distinct as, say, Calatrava's New York City stegosaurus, they incorporate much more design than the standard-issue American transit depot. A little farther south in the Boston area, New Balance is building a commuter rail station as part of their new $500 million complex. A look at some of the new stations via Somerville Transportation Equity Partnership.